Daffodils blowing in the breeze are a true sign that spring is approaching! With their distinctive flowers and sweet scent they are a must-have for any garden. Plant in pots, containers or straight in the ground now for a fantastic display next spring! 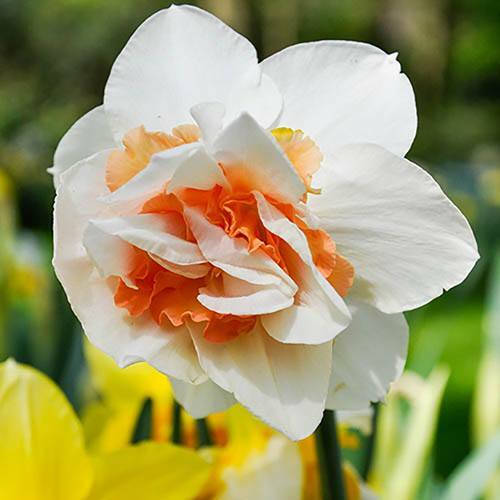 A fantastic double flowering variety which produces large, creamy apricot coloured blooms. Supplied as a pack of 12 bulbs, ready for planting. A real British favourite, Daffodils blowing in the breeze are a true sign that spring is approaching! With their distinctive flowers and sweet scent they are a must-have for any garden and have been for hundreds of years. Plant them in pots, containers or straight in the ground this autumn for a fantastic display next spring and for years to come! Replete is a fantastic double flowering variety which produces large, creamy apricot coloured blooms that can reach over 10cm across.